Fourth place during the first week of March at the ITTF-Africa Top 16 Cup in Nairobi, it was a most creditable performance from Congo Brazzaville’s Saheed Idowu, a player who currently plies his trade in the Portuguese League. He will be on duty at the forthcoming ITTF African Championships, play commencing in Port Louis, Mauritius on Monday 3rd September. Notably in the Kenyan capital city, after finishing in second place in his group, losing to Nigeria’s Quadri Aruna; at the quarter-final stage he beat the latter’s colleague, the living legend, Segun Toriola before losing in the penultimate round to Egypt’s Omar Assar, the eventual champion. In the play-off match for third place, he experienced defeat at the hands of Ahmed Ali Saleh, like Omar Assar from Egypt. 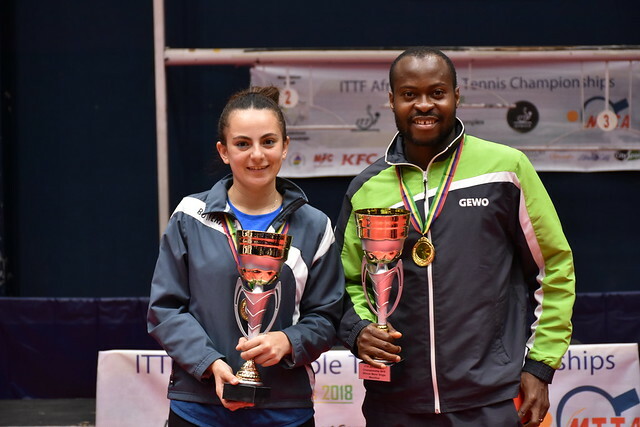 Success in Nairobi but in Lagos for the Nigeria born star at the 2018 ITTF Challenge Seamaster Nigeria Open, it was a second round defeat at the hands of the host nation’s Kazeem Makanjuola. Presently, Saheed Idowu, is preparing for the new Portuguese League season and is in a confident mood as the tournament in Mauritius approached. Most certainly, Saheed Idowu is a name to note.